You read that right, folks: Thanksgiving is nearly upon us, only a few short weeks away. And so begins the preparation for the best meal of the year. If you haven’t hosted Thanksgiving dinner before, you might be wondering how to choose the right turkey for you and your family. Here are some tips to ensure you find the perfect bird for this Thanksgiving. The first thing you’ll need to do is figure out the turkey’s size. You don’t want to end up with a bird that’s too small or you won’t have enough meat to go around! If you want to have plenty of leftovers for the weekend (and who doesn’t? ), you should look for a bird that’s about as heavy as 1.5 to 2 pounds per person coming to dinner. Once you have the turkey’s weight in mind, you’ll need to decide between the traditional grocery-store turkey and a fresh turkey. Grocery store turkeys are usually sold frozen, so if you’re choosing a bird from your local supermarket, make sure to factor in additional thaw-time before you cook. You can expect the bird to spend about 24 hours per five pounds defrosting in the fridge. You should also try to get your turkey early. Once everyone starts to plan for the holiday, it can be hard to find a turkey that’s the right size. If you’re in the market for a fresh organic turkey, it’s best to order one of these through a butcher and be prepared to pick it up a few days before Thanksgiving. You won’t need to thaw this type of turkey, so it can go straight to the countertop to be dressed and prepared for the oven. 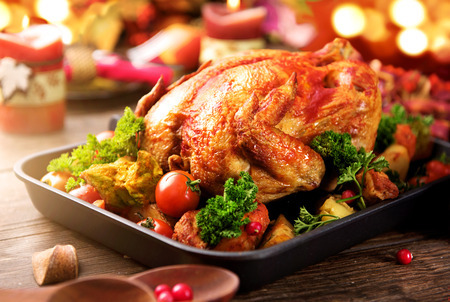 Once you decide what type of turkey is best for you, it’s time to plan the rest of the menu! Consider grabbing some eggs from the coop out back to use in cornbread, or whip up some delicious deviled eggs for appetizers!